We have science fair and Valentine’s Day on the calendar this month. A trip to Michael’s Crafts was inevitable. We hit the store yesterday, and after we completed our lap through all of the craft and school supply aisles, a small end cap display with Valentine baking supplies happened to catch my eye. 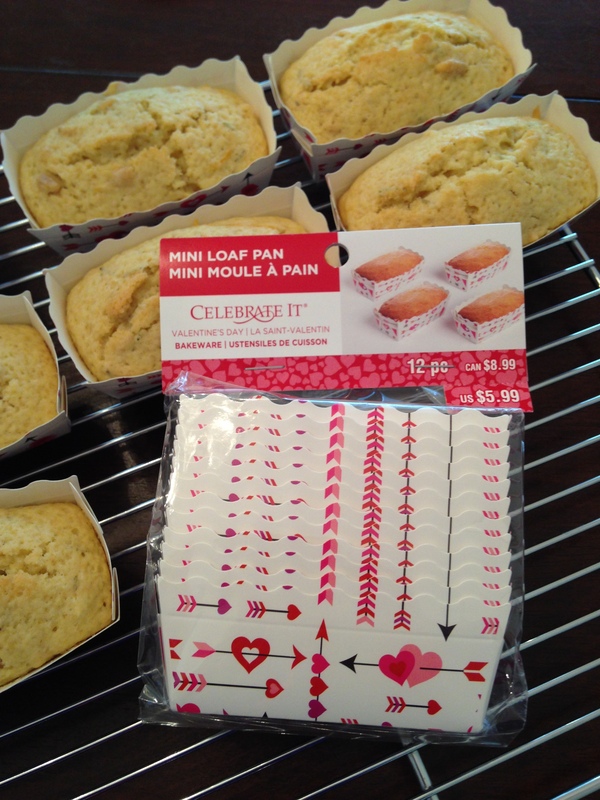 Mini paper loaf pans– with hearts! Does it get any better? 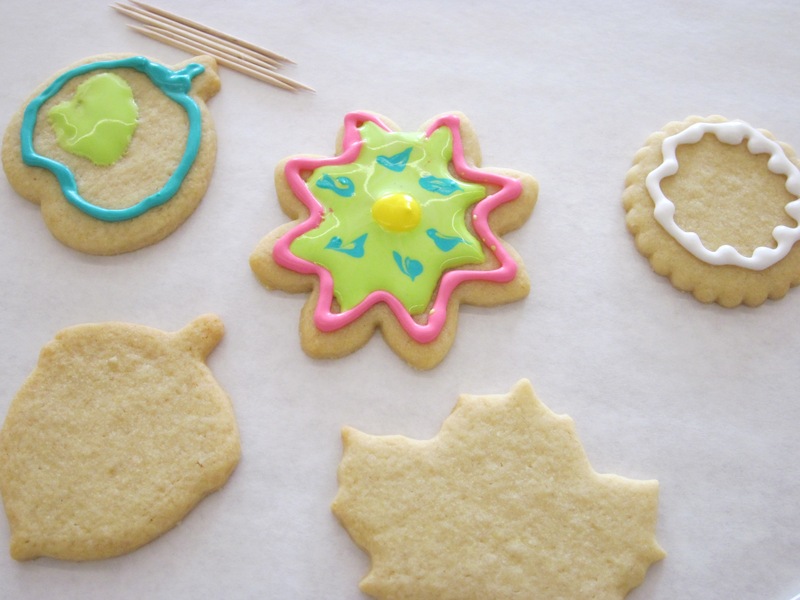 Mini + baking + holiday craft all in one. I bought the last two bags of mini loaf pans and immediately came home to make small breads and cakes. I baked this Savory Rosemary and Pine Nut Bread in 12 of the pans and a “faux” chocolate chip pound cake in the other 12 pans I had (recipe below). 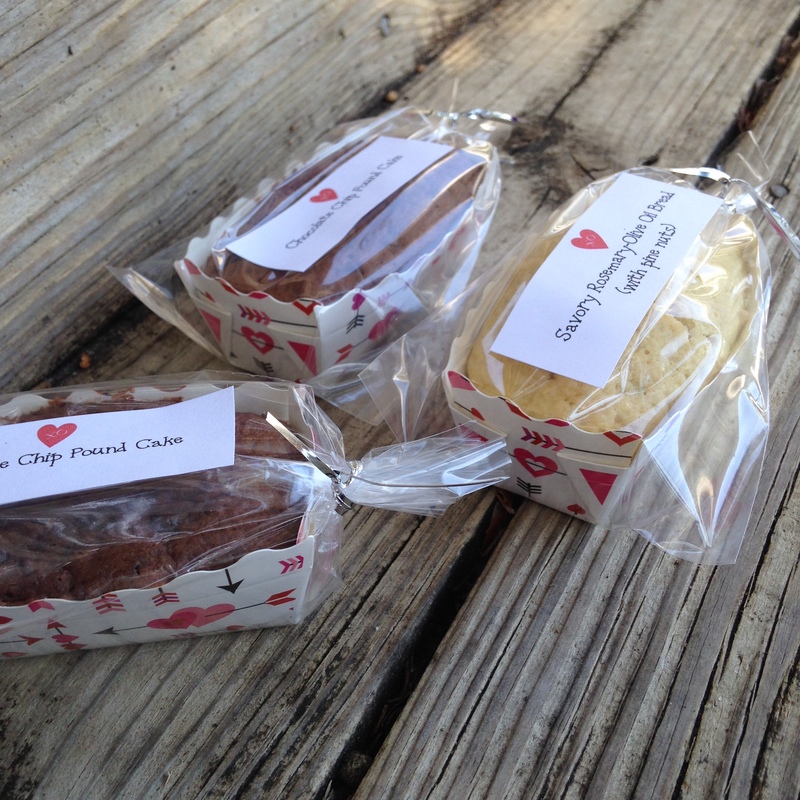 We wrapped the mini loaves in 3″ x 4″ clear plastic treat bags and used a twist tie to close. 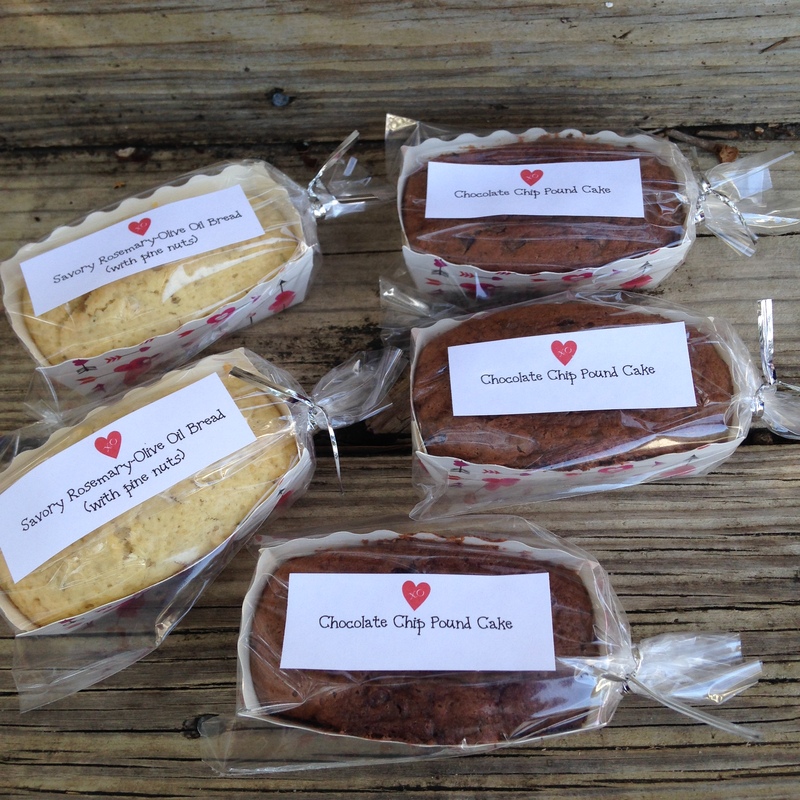 I printed labels for the bags with a small heart motif, and we will be delivering these little treats to my children’s teachers for Valentine’s Day. 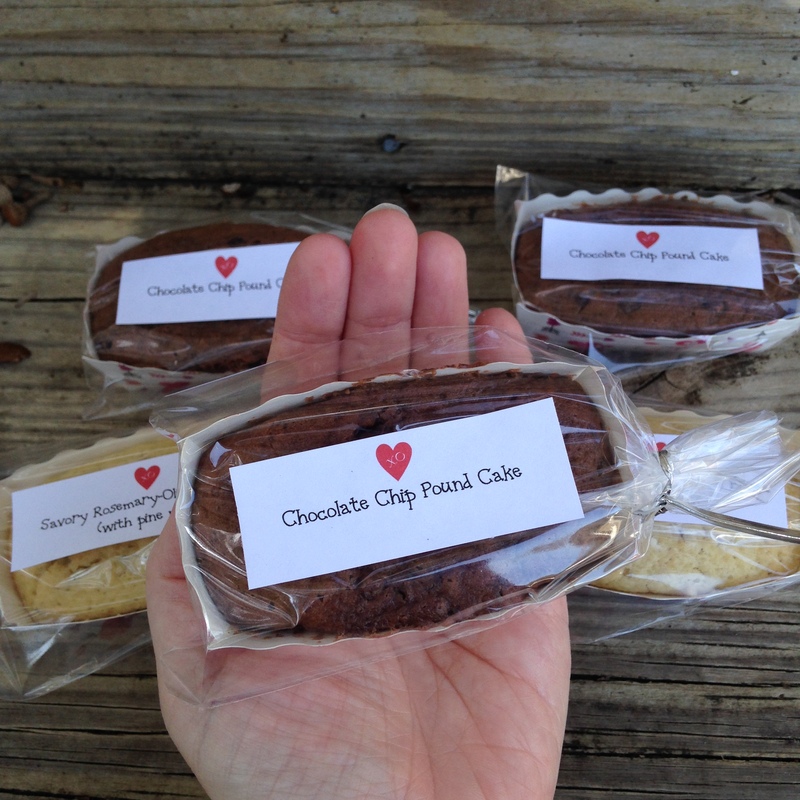 They make a great teacher gift because they are a single serving and are easy for little people to carry to school and deliver. Stir cake mix and pudding mixes together in a large bowl. Add eggs, oil, and water. Beat by hand until smooth. Stir in chocolate chips. You can coat the chocolate chips with about 1/2 T. flour before adding to the batter to keep them from sinking to the bottom during baking. 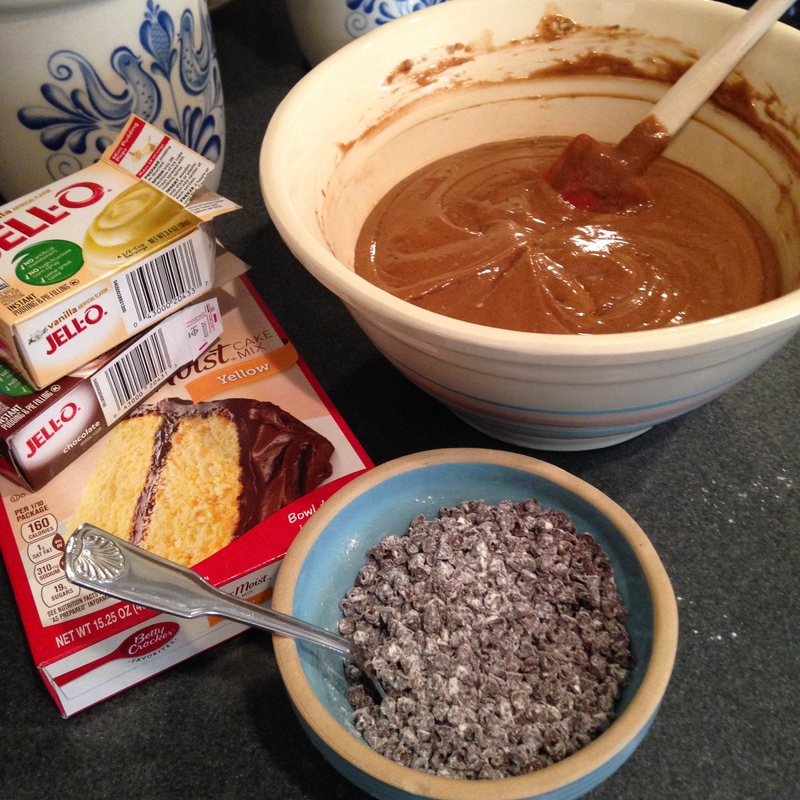 If you are making mini sized cakes, use mini chocolate chips. 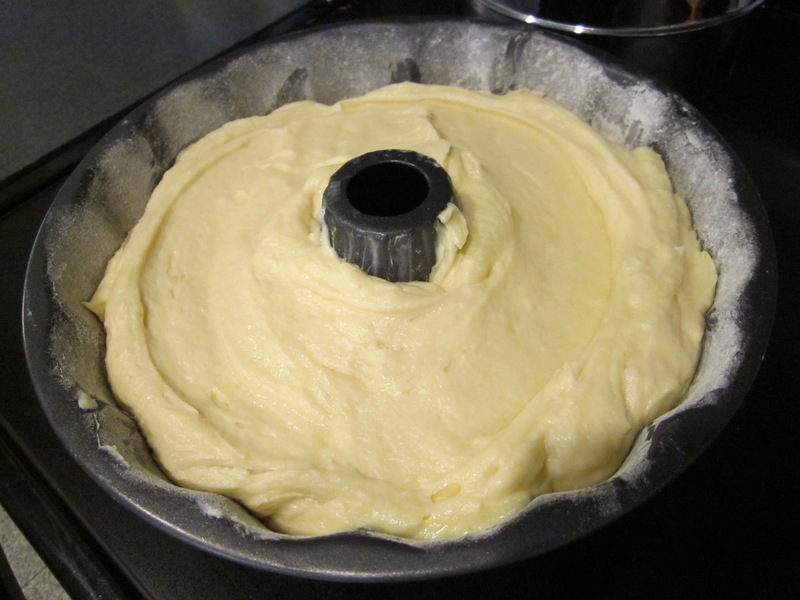 Pour into a greased and floured bundt pan. 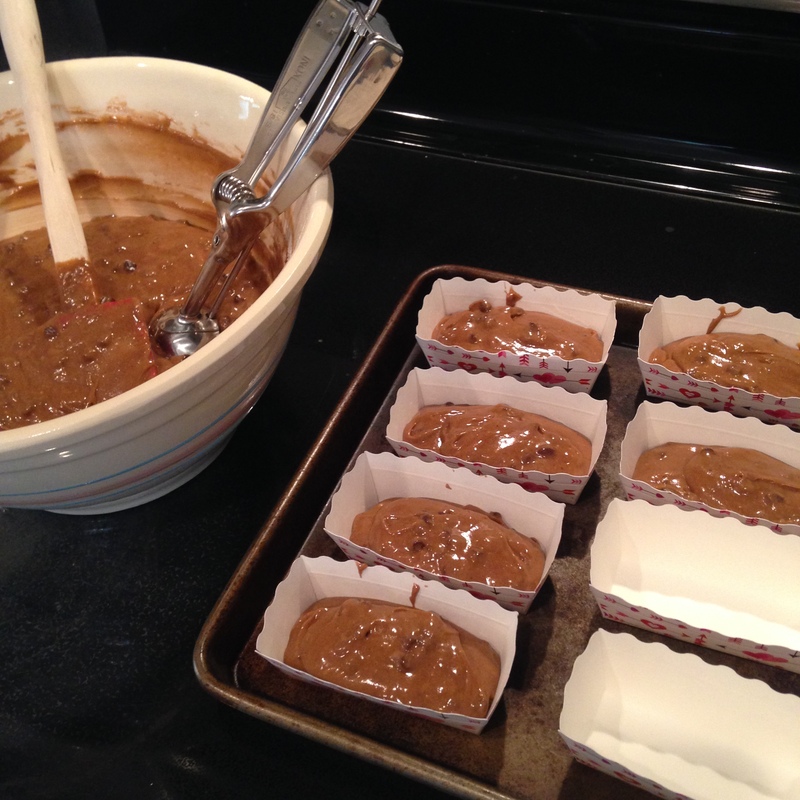 If you are using the mini paper loaf pans, you do not need to grease or flour the pans. You will fill the mini pans about halfway. Bake 1 hour at 350 degrees or until a skewer inserted in the center comes out clean. 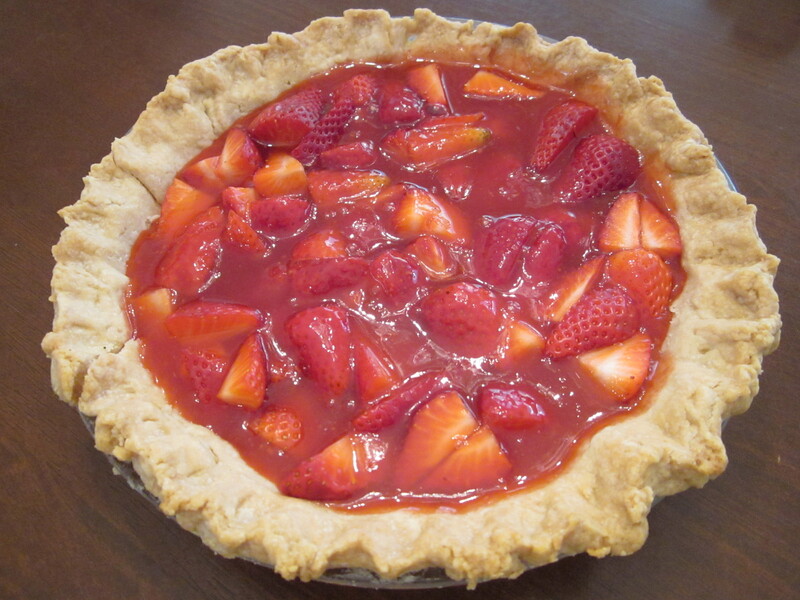 If baking the mini size, reduce baking time to ~30 minutes. Cool 20 minutes and remove from pan. If using the mini pans, leave in the paper pans. 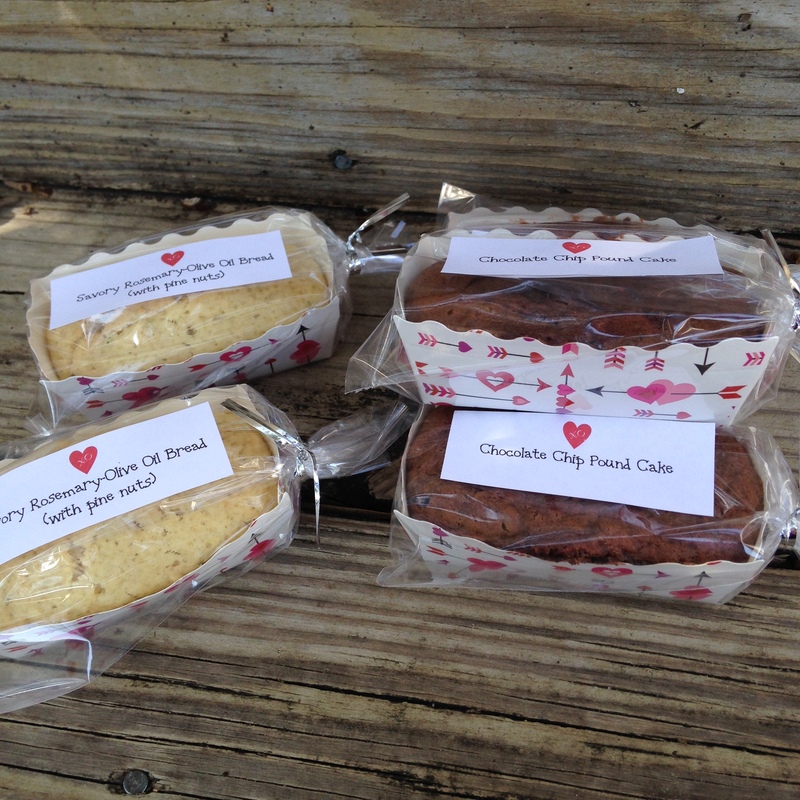 The mini paper loaf pans can bake in a temperature up to 400 degrees. They do not need to be greased. To get your bread or cake out of the little pan, you unstick the corners and pull the sides away when serving. My school has a birthday buddy system among the teachers and staff. It is basically a birthday version of Secret Santa. People who want to participate secretly draw a name from a hat. On the birthday buddy’s big day, the assigned person anonymously brings a small gift (not to exceed $10) and usually a food treat too that can be shared with the faculty. In honor of my buddy’s birthday this week, I got her a small personal gift and baked a coffee cake that I left in the staff kitchen. The birthday buddy had the first slice honors and then kindly e-mailed everyone to let them know that a treat was available in the kitchen. When I arrived on the scene at 9:47, there were two slices left. Teachers are always hunting around for a little snack mid morning and/or need a bite to tide them over if they have forgotten to pack a lunch. Teachers love having a group snack appear in the staff room or faculty kitchen. Cream butter and 2 c. sugar. Add eggs then sour cream and vanilla. Sift together flour, baking powder, and salt in a separate bowl. 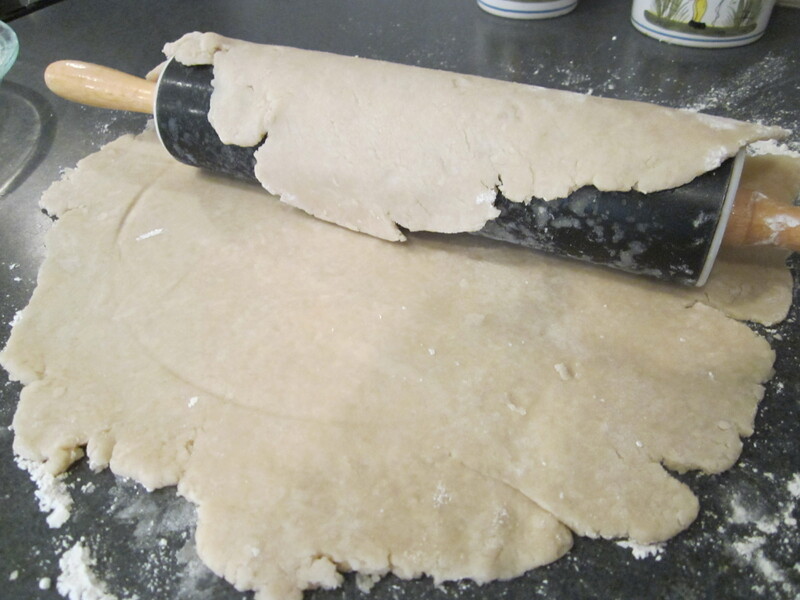 Fold dry ingredients into wet ingredients. In a third bowl, combine remaining 3/4 c. sugar, chopped nuts, and cinnamon. Spray bundt pan with Pam. Spoon half of the batter into the pan and spread gently with a spatula to level the batter. Sprinkle 3/4 of the nut mixture on the batter. Pour the remaining batter over the nut mixture and gently smooth the top. Sprinkle the remaining nut mixture on top. Bake for 1 hour. Let sit for ~20 minutes and then invert the bundt pan onto a plate. Speaking from experience, the baking powder ingredient is important. It is NOT baking soda. There is a difference! 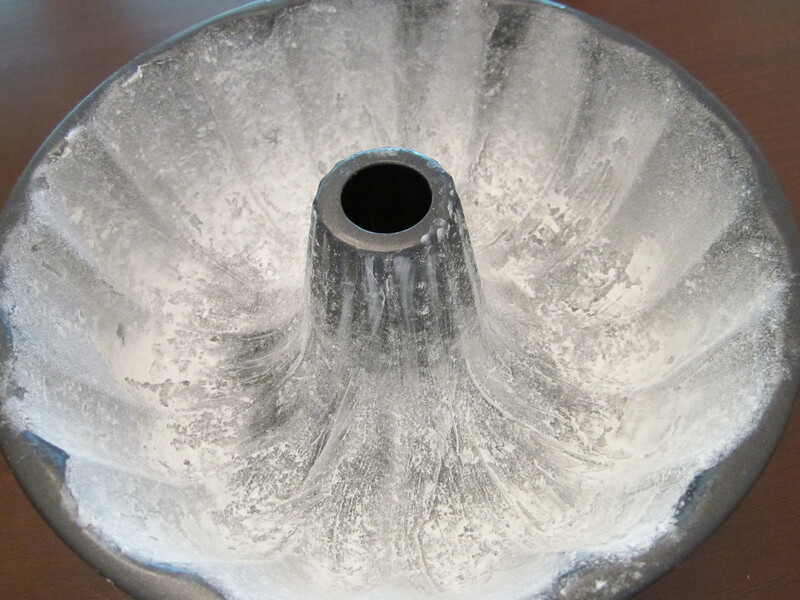 Make sure the bundt pan is greased well or the cake will not come away from the pan cleanly. 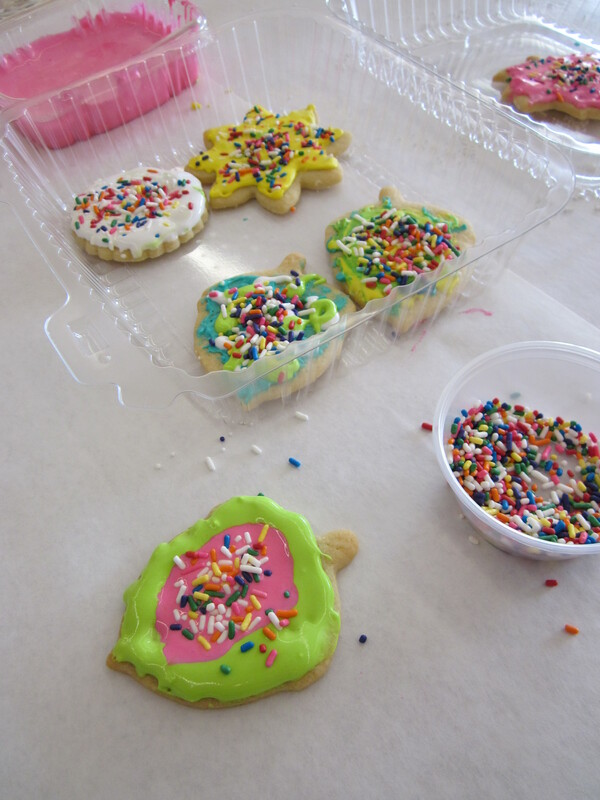 Last summer, we visited a newly opened cookie and cake decorating shop in St. Louis while visiting Sewing Sister. Sweetology had a wall of sprinkle choices, an entire counter for mixing icing colors, and shelves full of tools and cutters for creating shapes to decorate pre-baked cookies, cupcakes, and cakes. It was dessert decorating heaven. Miss Priss wanted a cooking birthday party of some kind– preferably a party with lots of icing and sprinkles. I briefly toyed with the idea of hosting at home but then began scouting cupcake and cooking locations. I started by calling our local cupcake shops who offer party packages, but I learned that the party’s primary activity is mixing the batter and baking cupcakes. We wanted to spend more time actually decorating. I finally called the Southern Season cooking school near our home, and they worked with me to organize a party with pre-baked cookies and lots of decorating. The staff at our party showed us a pipe and flow technique, so everyone got to use piping bags (so fun) and they offered a variety of decorating materials to top the icing too. The Invitation: I like paper invitations. I am about the only mom who still sends invitations via USPS, but choosing an invitation is one of my favorite parts of planning a party. 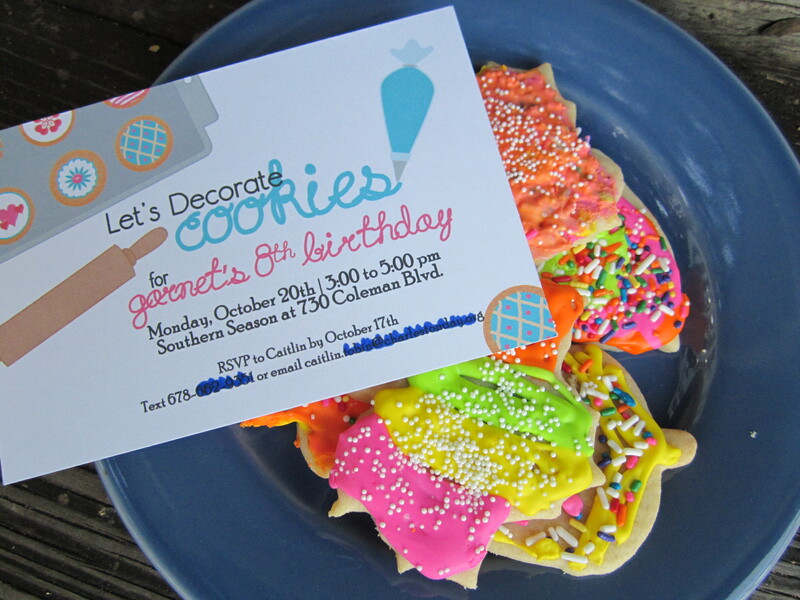 I found lots of cute invitation options with a cooking or cupcake theme, but it was harder to find an invite with a cookie design. I finally found This Invitation on ArtFire.com. The owner e-mails a proof and then prints the paper invitations and mails them the day after the sample is approved. It is a home business, and it took over a week (8 days) to receive the proof (her store site states she will send a proof in 3 business days). The owner replied to my e-mail inquiries, but the turnaround was too long for my OCD tastes. The Cookies: The cooking school had a long table covered in white paper. 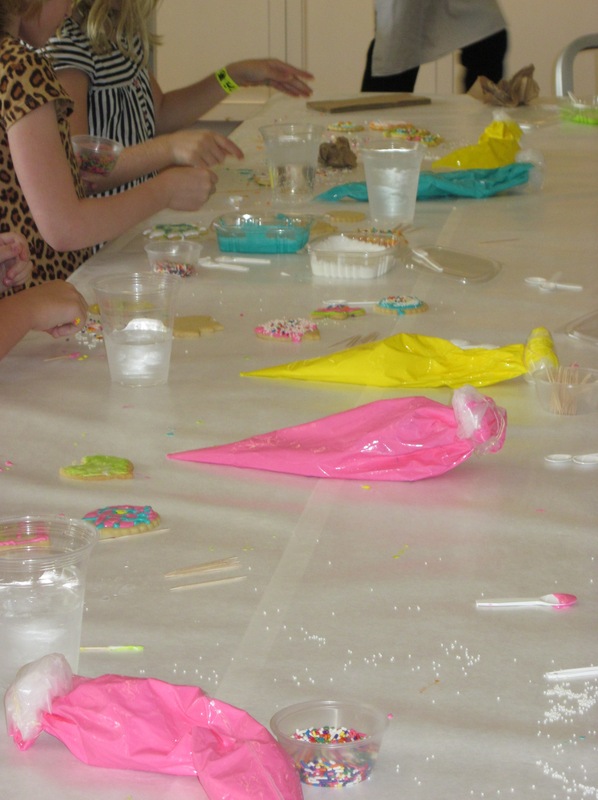 They had various bright colored icing in piping bags and “looser” icing in plastic containers. They provided small plastic spoons and toothpicks to help with the icing distribution. There were 5 pre-baked sugar cookies in fun fall shapes at each place. The girls received a short demo about how to pipe a design using the piping bags and “tighter” icing. They needed to wait a few minutes for the piped icing to set. Then, the guests spooned small amounts of the loose icing into the open spaces on the cookie and spread it gently into the nooks and crannies. As a final touch, the kids could add sprinkles. I forgot to ask what type of icing we used, but I think it was probably royal icing since it hardened pretty quickly. 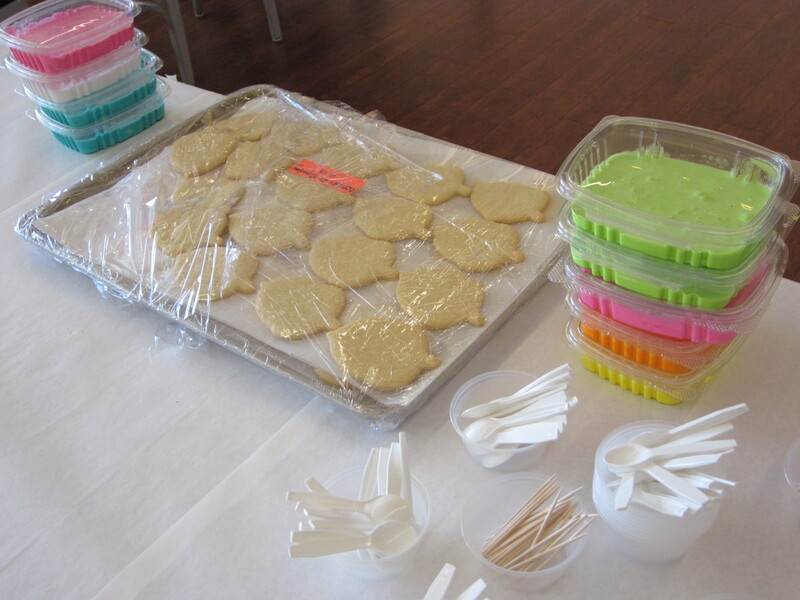 The Party Favors: The cookie school had clear plastic boxes to transport any uneaten cookies home. 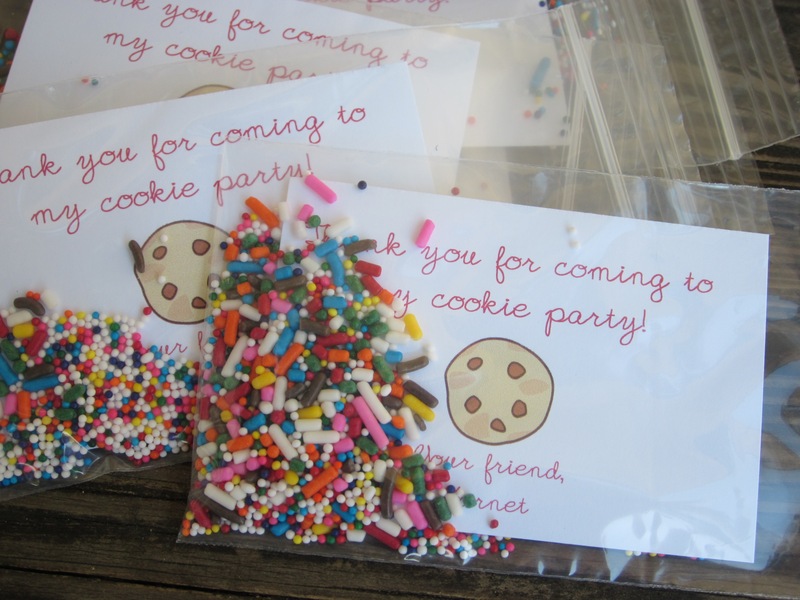 I printed business card sized Cookie Party Favor Card Inserts on card stock and put them in small reclosable bead storage bags (3″ x 5″) I purchased at Michael’s Crafts. 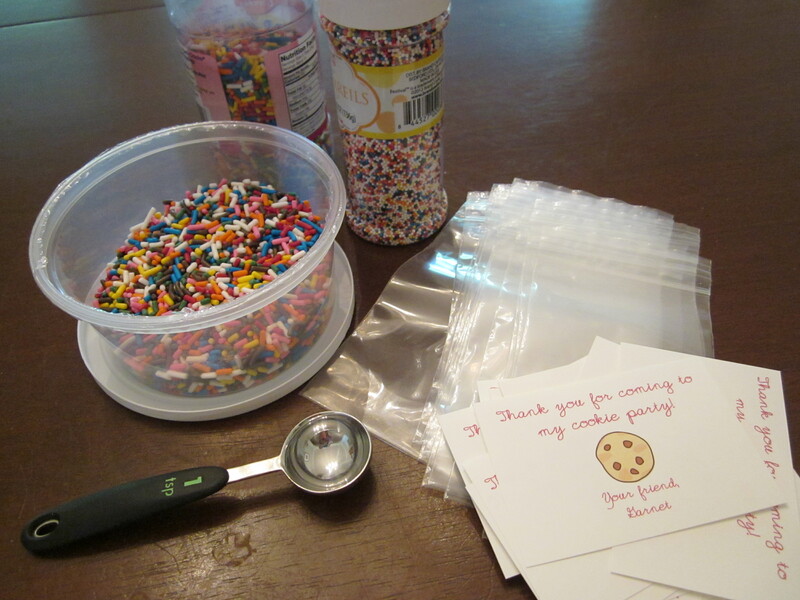 Miss Priss added 1 t. of jimmie sprinkles and 1 t. of nonpareil sprinkles to the baggies. It looked like edible confetti! We added one little baggie of sprinkles to each box of cookies. The cooking school distributed a copy of the sugar cookie recipe too. The Time: We booked the party for 2 hours, but 90 minutes would have been perfect. 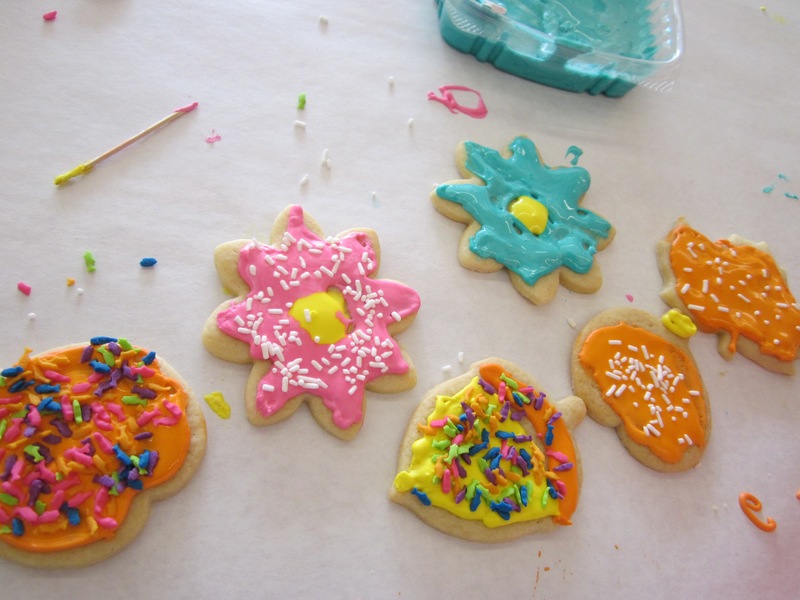 The girls decorated every cookie Southern Season had, and we still had 30 minutes left before parents arrived. I ended up siting on the floor with our group and playing games like Telephone and the Grocery Store Memory game because a dozen 2nd grade girls who have just eaten boatloads of sugar and have nothing to do is a deadly combination. I actually had to tell several of them to stop licking the table. The best part of the party was the clean-up. None for me! If you plan a cooking party of some kind, do not try this at home. Outsourcing this party was the best decision I made. 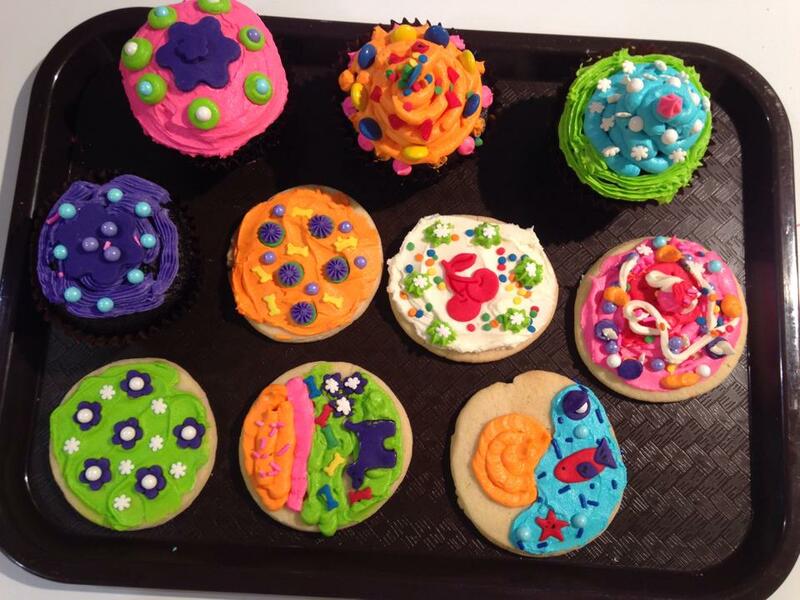 If your child would like a cooking birthday, start with the cupcake stores in your area. Almost all of the cupcake shops near me had private event options. 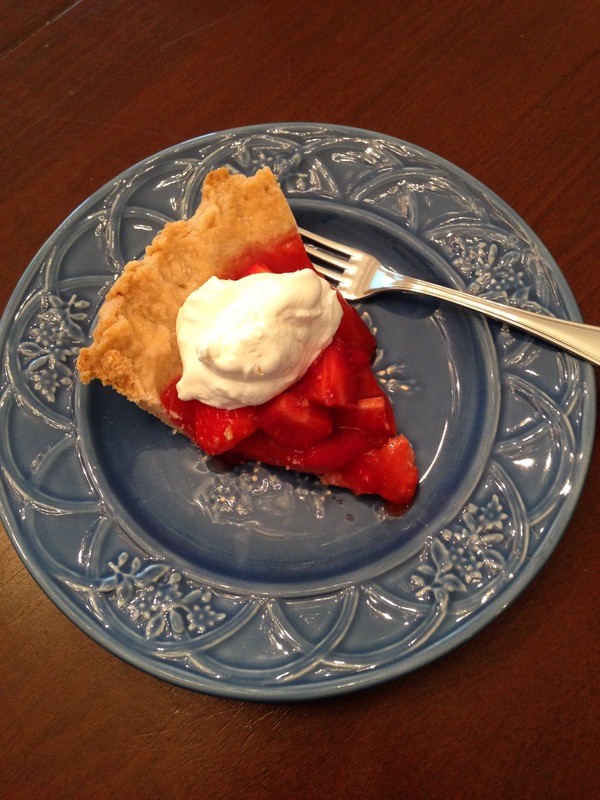 Have you hosted (or attended) a cooking party of some kind? What worked well and what did not? Aunt B arrived yesterday with her two boys. Sewing Sister arrives tomorrow with her girls. I will have a full house for the next few weeks. Since I live near the beach, we have houseguests during the summer fairly regularly. I have systems and procedures for everything much to the frustration of TheRoomDad. In order to get ready for any friends and family who may be visiting, there are a few houseguest preparatory measures I follow. I collect hotel shampoos and lotions throughout the year, travel toothpastes from dentist visits, and Christmas toothbrushes and keep them in a special “guest” drawer in our bathroom that people can use when they visit. Guests are welcome to use any of the toiletries. I also keep an extra hair dryer in the bathroom for guests. I have a secret addiction to junky magazines like Us and In Touch. After reading an issue, I will keep a stack in our spare room. Guests are welcome to read them when they visit. I keep a stack of paperback beach reads in the room too. I stock the refrigerator with “group food”, so people can serve themselves a little bite at any time. Some of my favorite items to have on hand are DILL DIP and BLACK BEAN SALSA DIP. I thrive on party food and love to make it. I am not sure why it is so different from the day to day monotony of preparing family meals (which I dread), but it is. I find that food preparation and kitchen maintenance are the hardest pieces to manage when guests are in town. 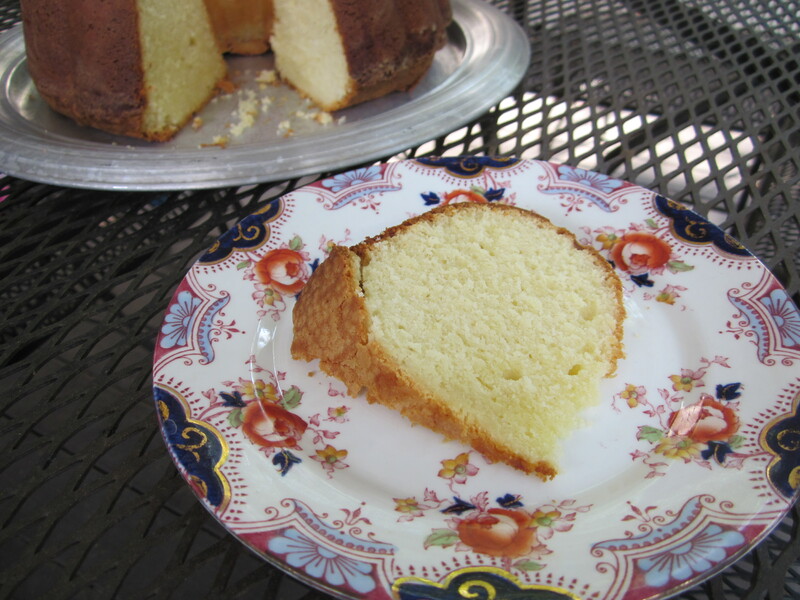 For this particular family visit, I baked a pound cake, which is one of Aunt B’s favorites. 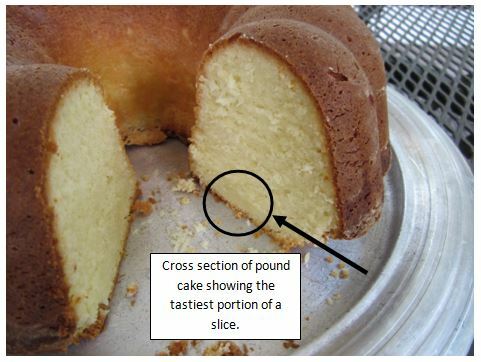 I think this is kind of a traditional version of pound cake because if you Google “cream cheese pound cake” you get many results with the exact recipe that I use. I have been having problems with my Bundt pan, but I finally just threw the thing away and bought a new cake pan. Success! The pound cake turned out perfectly. Most recent baking attempt with the old Bundt pan. 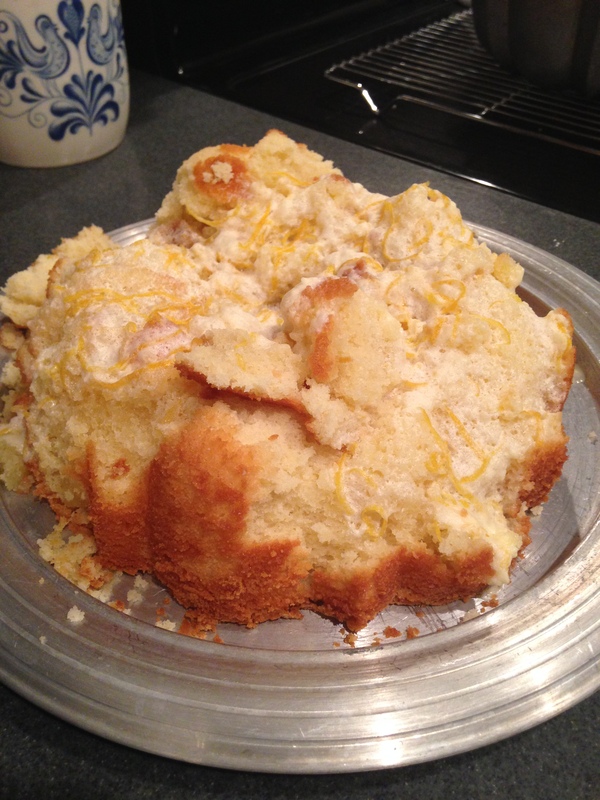 This should have been a glazed lemon cake. 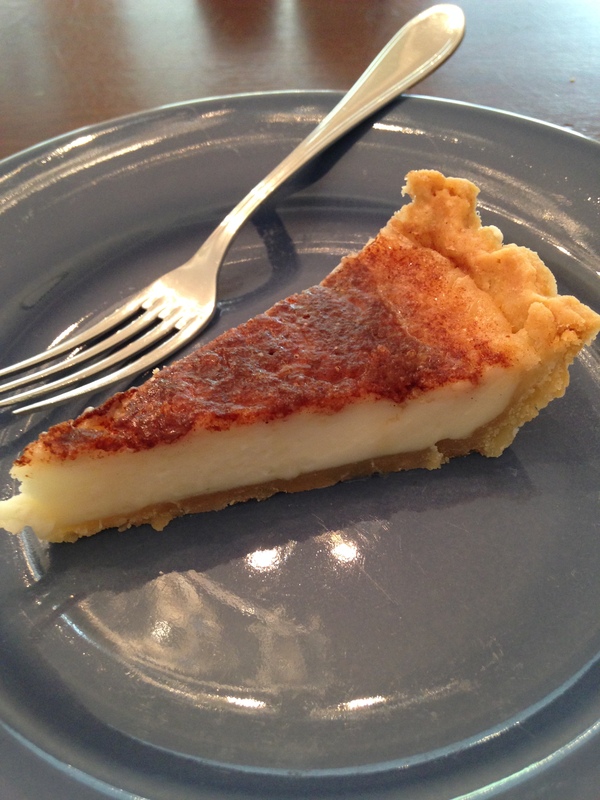 Blend butter and cream cheese. Add sugar until well mixed. Add eggs one at a time and then vanilla. 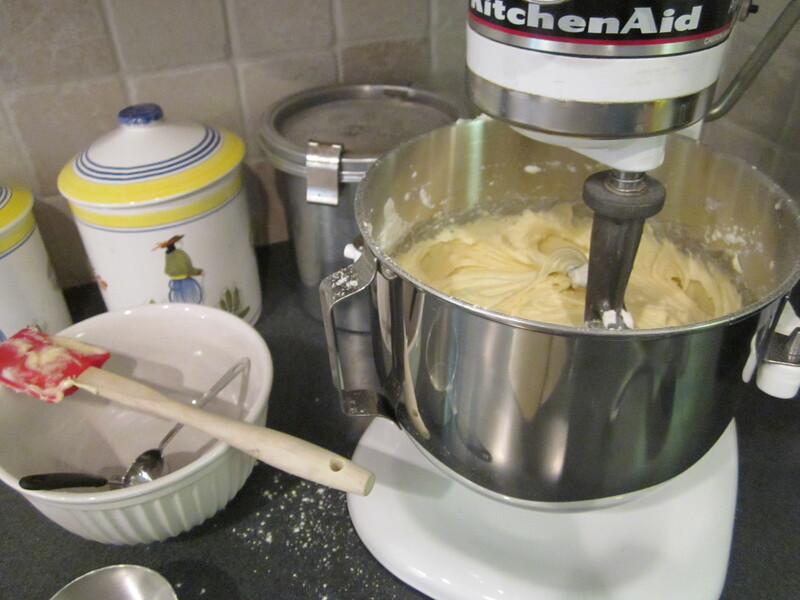 Put mixture in greased and floured Bundt or tube pan. Bake for 1 1/2 hours. Remove from the oven and let sit for ~5 minutes. 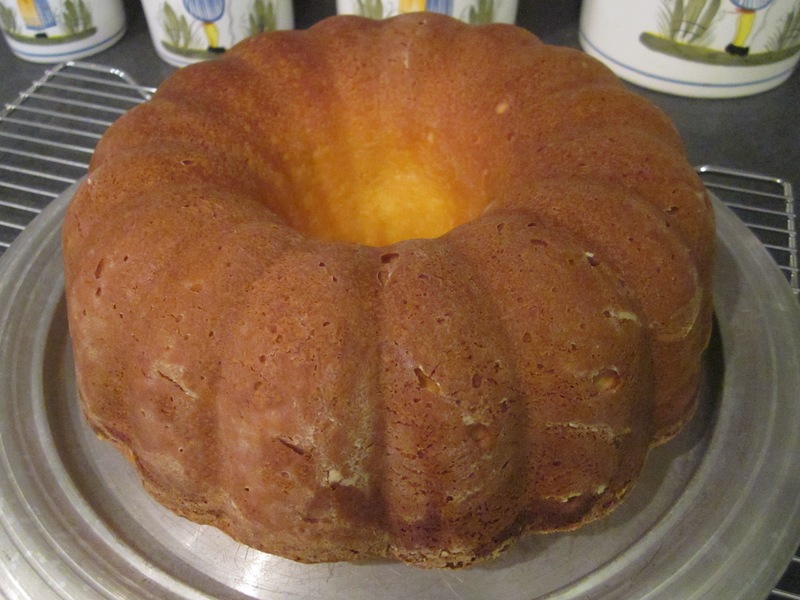 After the cake rests for a few minutes, hold a cake plate on top of the Bundt pan and turn over, so the cake will drop into the middle of the cake plate. 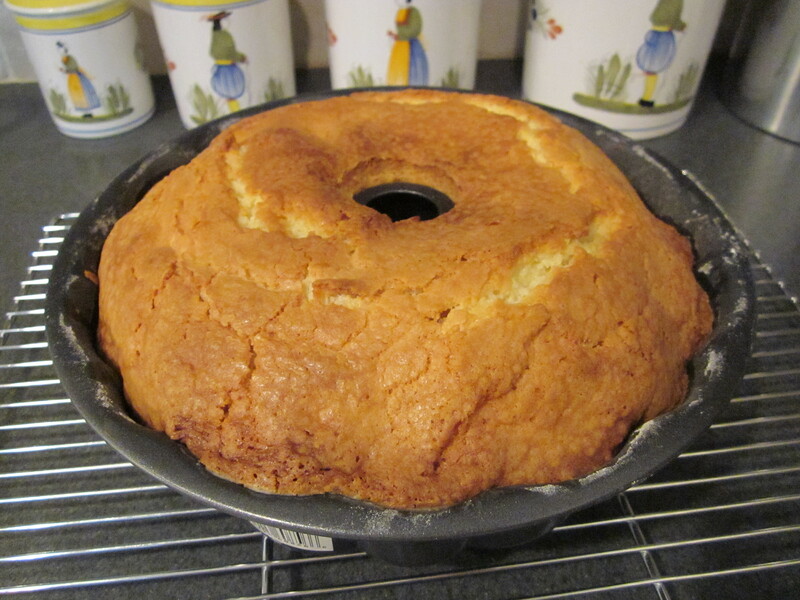 Let the Bundt pan stay on the top of the cake until you can see that the cake has dropped onto the cake plate. 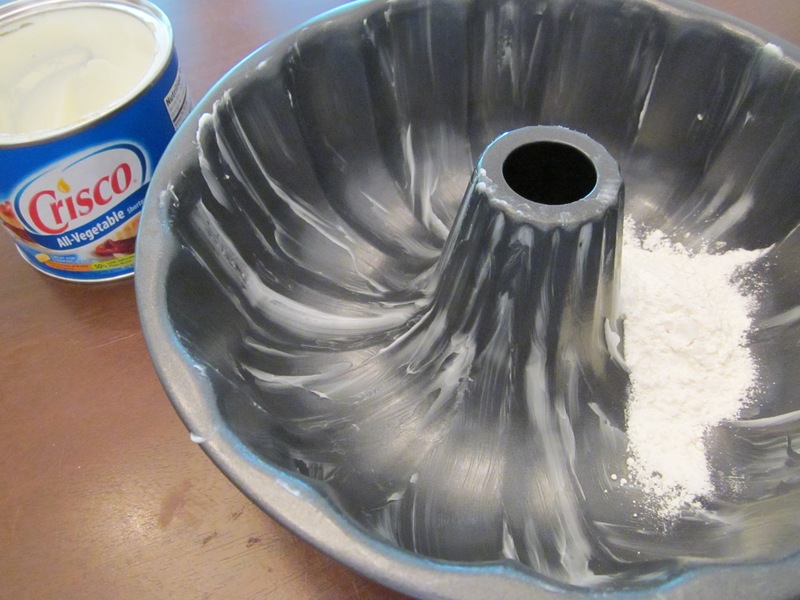 To grease and flour a Bundt pan, cover the inside of the pan completely with Crisco. Scoop about 1/4 c. flour into the bottom of the pan. Holding the pan over a sink, roll (and tap) the pan around on its side letting the flour stick to all parts of the Crisco. Make sure that you turn the cake out of the pan while it is warm. This will help make the layer that sits on the cake plate squish down a little and be crispy and moist at the same time. That bottom portion of each slice is TheRoomMom family’s favorite bite of cake. What strategies do you have for overnight guests, or do you just book a hotel room?